Prepguard - CDV-700 Geiger Counter Rebuild Service! Rebuild & Calibration Service - ENI Electro-Neutronics Inc - We rebuild YOUR meter for you! ENI Electro-Neutronics Inc. Rebuild Service (cost includes insurance & return shipping any.. Rebuild & Calibration Service - Anton 5 or 6 - We rebuild YOUR meter for you! Anton 5 & 6 Rebuild Service (cost includes insurance & return shipping anywhere in the.. 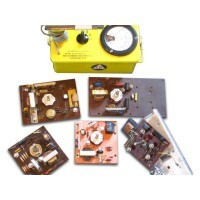 Rebuild & Calibration Service - Lionel 6B - We rebuild YOUR meter for you! Lionel 6B Rebuild Service (cost includes insurance & return shipping anywhere in the USA!).. Rebuild & Calibration Service - Victoreen 6 & 6A - We rebuild YOUR meter for you! Victoreen 6 Rebuild Service (cost includes insurance & return shipping anywhere in the USA.. Rebuild & Calibration Service - Victoreen 6B - We rebuild YOUR meter for you! Victoreen 6B CDV-700 Revuild service (cost includes insurance & return shipping anywhere i..